Many years ago, I invited Anna Syperek to share lunch with me at my home, in Antigonish, Nova Scotia. I loved her watercolours as well as her etchings and I had begun to paint. I hoped she would look at my work. She had suggestions to make that were extremely helpful. I had taken several courses on the history of art and a few lessons on how to do watercolours. I therefore knew the basics, but she told me that my work was good enough for me to start painting seriously, and I did. Antigonish’s Art Gallery is Lyghtesome Gallery. So I started bringing paintings to the Gallery. It’s a very friendly place and many of its artists are very accomplished. Well, there I was showing little paintings at Lyghtesome. I participated in Group exhibitions because, usually, I was also teaching. I have since left Antigonish. I was overworked out of the classroom, and my case manager at the Insurance Company fooled me into thinking that my application for permanent disability benefits had been accepted. She did not relay to me the instructions of the doctor she sent me to for a second opinion. He had asked her to tell me not to leave my home as I would recover. She said nothing. When I was told me to leave the classroom, I presented a doctor’s note, but the Chair of my department did not take it seriously. I therefore dragged myself to the classroom and completed my assignment for that particular academic year. So my case manager at the Insurance Company decided I was an imaginary invalid and punished me by not letting me know that I would be able to return to work after an indefinite leave of absence. And she had not told me not sell my house. When I left Antigonish, I no longer wanted to leave, but the process was in motion. So I moved. In other words, I was worked out of the classroom and fooled into selling my house. However, I enjoy blogging. There are days when I can write an informative post. And there are days, like today, when posting a lovely picture and remembering friends is all I can do, which is fine. And now I have new friends: other bloggers and readers. You are a very fine group of people. You even forgive me when I make mistakes. Besides, the internet is a miracle. Thank you WordPress. This is the link to Lyghtesome Gallery: just press on Lyghtesome Gallery. 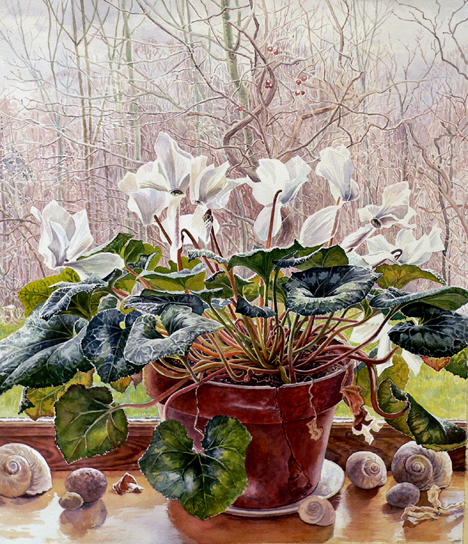 I am not sending my work to the Gallery anymore, but I just might… Here is Anna’s website: Anna Syperek, CSPWC (Canadian Society of Painters in Water Colour).